Johor Baru: The stepmother of the Sultan of Johor, Sultan Ibrahim Almarhum Sultan Iskandar, passed away on the evening of March 17, Sunday, at the age of 78. 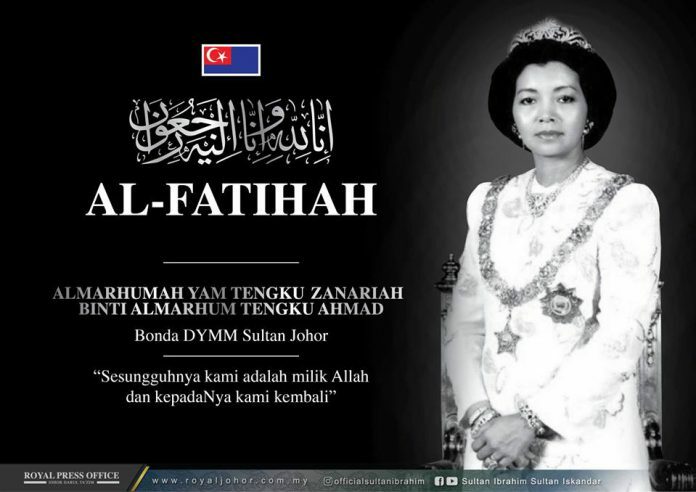 The Sultan of Johor announced the demise of Tengku Puan Zanariah on his Facebook page shortly after 8:00am Monday, March 18. She was married to Sultan Iskandar in 1961 until his death in 2010. Her remains were first taken to Balai Mengadap Istana Bukit Serene at 10:00 am on Monday. By 2:00 in the afternoon, her remains were brought to the Mahmoodiah Royal Mausoleum in Johor Baru by the Sultan of Johor’s private ambulance and then laid to rest. She was buried near the remains of her mother, Che Puan Hajjah Fatima. Before she was laid to rest, Datuk Yahya Ahmad, the Johor Mufti, performed a talkin and tahlil reading. Sultan Ibrahim and Permaisuri of Johor Raja Zarith Sofiah Almarhum Sultan Idris Shah, as well as Tunku Tun Aminah Sultan Ibrahim; Tunku Temenggong Johor Tunku Idris Iskandar Sultan Ibrahim; Tunku Panglima Johor Tunku Abdul Rahman Sultan Ibrahim; and Tunku Putera Johor Tunku Abu Bakar Sultan Ibrahim. Johor’s chief minister, Menteri Besar Datuk Osman Sapian, also attended the burial rites. Paying respects at the palace were the Yang di-Pertuan Agong Al-Sultan Abdullah Ri’yatuddin Al-Mustafa Billah Shah and Raja Permaisuri Agong, Tunku Azizah Aminah Maimunah Iskandariah, as well as Raja Perlis, Tuanku Syed Sirajuddin Putra Jamalullail and Raja Perempuan Perlis, Tuanku Tengku Fauziah Almarhum Tengku Abdul Rashid. The Sultan’s mother, Enche’ Besar Hajah Khalsom Abdullah, died last year, on June 1, 2018, at the King Edward VII hospital in London. She had been 83. Her remains were flown to Johor Baru on June 5 by Sultan Ibrahim’s personal private plane, and she was laid to rest on the following morning after a funeral ceremony took place at the Bukit Mahmoodiah Royal Mausoleum. For the Sultan’s late mother’s funeral ceremony, the Johor Council of Royal Court president Datuk Abdul Rahim Ramli announced that “A special pedestal which was designed by the late Sultan Abu Bakar in 1886 will be used to ferry the coffin which will be pulled by 40 Johor Military Force personnel. Members of the public who wished to attend the procession to give their final respects were allowed to do so, provided they were appropriately attired. She had three more children aside from the Sultan of Johor, princesses Tunku Kamariah Aminah Maimunah Iskandariah, Tunku Besar Zabedah Aminah Maimunah Iskandariah, and Tengku Puan Pahang Tunku Azizah Aminah Maimunah Iskandariah.